Over the last few months here at Seasoned Pioneers we’ve been updating our range of spices and seasonings. Our latest additions include a wider selection of dried herbs as well as explosive Shichimi Togarashi and Peri Peri Seasoning blends – as always produced from authentic recipes and dry roasted for maximum flavour (see below for a full list of new products). To reflect these changes, we’ve also updated Worldwide Seasonings Reference Guide. As well as providing details of our range, this is intended as an essential guide to world seasonings giving information about flavours and uses. For your free copy of the Guide, please e-mail us at info@seasonedpioneers.c0.uk with your name and address and Reference Guide in the subject line. The name of this blend from Japan means seven spices and the recipe we’ve used includes red chillies, orange peel, black sesame seeds, sesame seeds sansho pepper, ginger root and nori flakes. The seeds give it a nuttiness, the ginger and the sansho give it a warmth and the red chillies give it a kick (and a SP heat rating of explosive!). 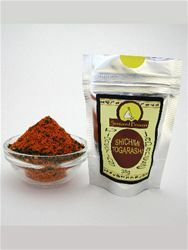 It’s great sprinkled on udon and soba noodle dishes or used generally as a condiment. Alternatively mix it with a little bit of sugar and salt and use it as a coating for meat or tofu (you might want to add a bit of oil to the mix if you’re going to coat tofu) before frying in a hot pan or on a griddle. You can also add the spice blend, sugar and a pinch of salt to any flour your going to use to coat meat or tofu too, to give it that added something. 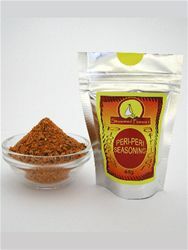 This fiery flavoursome blend of Portuguese-Mozambique origin is made up of Piri-Piri chillies, pimenton dulce, lemon peel, roasted garlic powder, unrefined sugar, sea salt, Tellicherry black peppercorns, onion powder, nutmeg and oregano. These all combine to give the blend a wonderful warmth and smokiness with citrus notes, while the Piri-Piri chillies give it it’s kick (and a SP heat rating of explosive!). It’s ideal mixed with a bit of olive and used as a rub for meat or to coat vegetables for roasting – even better mixed with a dash of lime juice to really complement the flavours. We currently have no text based recipes online for our new products, but if you have one and would like to share it with us for us to put on our website, please e-mail us at info@seasonedpioneers.co.uk with the recipe title, ingredients, method and number of servings – and don’t forget your name so we can give you the proper credit!